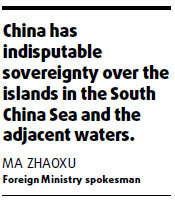 Spratly Islands - China's precious pearls in the South Sea! China has urged a UN commission not to review a submission from Vietnam and a joint submission from Malaysia and Vietnam that question the location of the outer limits of the continental shelf. .....According to the CLCS Rules of Procedure, "in cases where a land or maritime dispute exists, the commission shall not consider and qualify a submission made by any of the states concerned in the dispute". With the opposition from China, the CLCS will not consider the joint submission in line with the rules of procedure, a spokesman told Xinhua. On 14 March 2005, representatives from national oil companies of China, the Philippines and Vietnam signed a Tripartite Agreement for Joint Marine Seismic Undertaking in the Agreement Area in the South China Sea in Manila. China Joined ASEAN Treaty on Cooperation China joined ASEAN Treaty on Cooperation Chinese Foreign Ministry Spokesman Reaffirms Sovereignty over Nansha Islands. Why the Nansha Islands belongs to China? A lot of historical materials proves China's sovereignty over the Nansha Islands (Spratlys or the Spraty Islands). China assures her sovereignty over the Nansha Islands also according the the United Nations Convention on the Law of the Sea. *UNCLOS)1981. Is Joint Development a Possible way out for the disputed Nansha Islands? Turning the Flashpoints into a Peace Keeping Sea? Is it really possible to turn the South China Sea from a Flashpoint into a Peace Keeping Sea?